We normally have tea & coffee, about 10.15am, so we can say ‘hello’ to each other. There will be singing, hymns and more modern songs, at the start and end of our time together, and at other times during the service. We will pray together; prayers are led by one person with others joining in silently. We have a collection and it is up to each person to decide if they wish to give. There is no expectation for visitors to contribute. We have a reading from the Bible; copies in the church are the New International Version but individuals use whatever version is best for them. An important part of our service is a message, usually from our Pastor, to help us understand the Bible’s teaching and what that means to each of us today. We have communion on alternate Sunday mornings, towards the end of our service. We share bread and wine in the way Jesus asked us, to remember how he died on the cross for everyone trusting in him. Everyone is welcome to stay, but please only take the bread and wine if Jesus is your own Saviour. We usually finish about 11.45am. The children go out to Sunday Club about 10.45am where they have a Bible story and other activities. 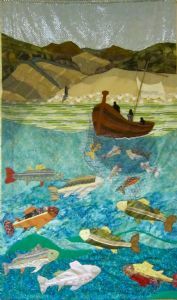 Wall hanging made by a church member showing Jesus and the miraculous catch of fish, John 21 4-6.